City in the province of Hanover, Prussia. Its Jews are first mentioned in a charter granted them in 1349. In 1613 they received a patent of protection from Johann Friedrich, Archbishop of Bremen; and on Sept. 28, 1615, he threatened that if the Hamburg council imposed a special Jewish safe-conduct on his protégé and court Jew "Solomon Herscheider, Jewish physician living at Stade," who had hitherto been permitted to conduct business and to trade in Hamburg without taxation, the Portuguese of the latter city would no longer be allowed free passage through his territory. In 1618 Solomon, the "protected Jew of Stade," who is doubtless identical with this Solomon Herscheider, was purveyor of silver for, or perhaps joint lessee of, the mint; in 1620, however, he was thrown into prison, apparently on a charge of embezzlement. There was a Jewish cemetery in Stade which in 1632 was turned into a garden. In the years 1628 and 1630 the tax paid by the Jews for their protection amounted to 60 marks per annum, whereas it had been 75 marks in 1624 and 180 marks in 1619. During the Danish siege of Stade, which ended the Swedish dominion over the city, a great fire broke out (Aug. 29, 1712) that destroyed the Jewish street and other quarters of the town. 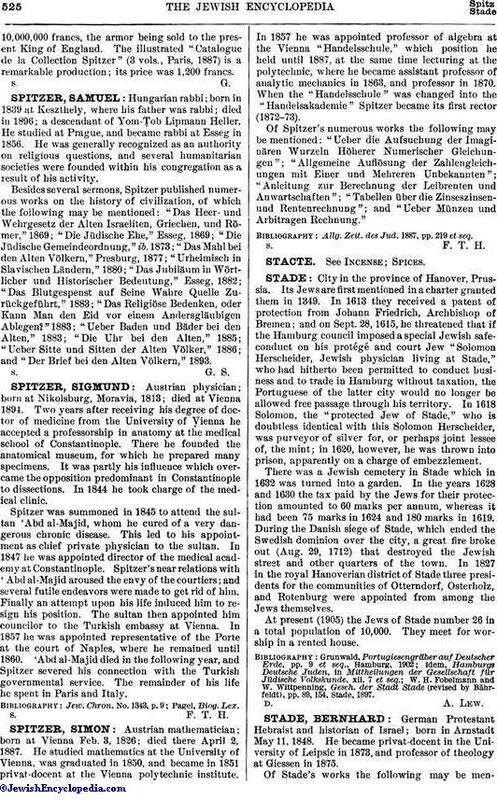 In 1827 in the royal Hanoverian district of Stade three presidents for the communities of Otterndorf, Osterholz, and Rotenburg were appointed from among the Jews themselves. At present (1905) the Jews of Stade number 26 in a total population of 10,000. They meet for worship in a rented house. W. H. Fobelmann and W. Wittpenning, Gesch. der Stadt Stade (revised by Bāhrfeldt), pp. 89, 154, Stade, 1897.